This is intended to relate how Marilyn and I dealt with the loss of a loved one not long ago. It’s basically in diary form, so, if it gets boring, I apologize in advance and invite you to click on a different post. We were slow getting up today because we had taken a fun, but long and tiring trip with part of our extended Ecuadorian family yesterday. Consequently, we didn’t get to our computers until about 10:00 a.m. Marilyn found an email from Marcia, our sister-in-law, that had been sent last evening. She said that Mark, Marilyn’s brother, had been hospitalized with a “serious brain bleed” and it didn’t look good. Marcia asked Marilyn to call Doris because Doris, Marilyn’s mom, needed to hear Marilyn’s voice. We fired up Skype right away and called. Marcia answered Doris’s phone. “How’s Mark?” “He’s gone.” “Oh, God. I’m so sorry.” He had let go minutes before we called. Mark had just turned 59 in August. We then talked to Doris for a few minutes, learning that the three of them had been up at Alta for the Labor Day weekend. Alta is a small community in the foothills of the Sierra Nevada about an hour from Sacramento, CA. Marilyn’s grandfather had built a house there when he and Marilyn's grandmother retired, mostly with his own hands. It had been inherited by Doris and recently passed to Mark. Mark had come downstairs after a 20-minute nap loudly complaining of a terrible headache. He’d never had anything like it before. He lied down in the downstairs bedroom. Marcia called 9-1-1 immediately, understanding something terrible was happening, while Doris made sure he didn’t roll off the bed. The medics responded in 15 minutes or less, but Marcia and Doris both say that Mark’s eyes were fixed and dilated by the time he was put in the ambulance. After we hung up, we consoled each other for a while. It was a shock to both of us. It seemed totally surreal. After all, Mark was younger than Marilyn. We expect dying to be an orderly process, with older siblings dying before younger ones unless there’s an accident, not to mention parents before children. That illusion was gone. Too soon, it was time for us to get to work. I looked up bereavement fares on the Internet and found that we needed the name of the funeral home in order to qualify. That meant we had to call Marcia again, something neither of us relished doing because this detail seemed so minor compared to what she must be going through at the moment. Not surprisingly, the funeral home had not been decided upon yet. We decided we’d go ahead and make reservations anyhow, regardless of cost. We had to be with Marilyn’s immediate family. Continental told us we could send the funeral home information at a later date, so we really hadn’t had to bother Marcia and Doris after all. We were able to book a flight out of Quito the next morning. Our travel would take us all the way to Sacramento instead of stopping for our normal visit in Texas – sixteen hours, counting layovers. At least, we proved to our family, and to ourselves, that we could return quickly if need be. We decided to go on with our plans for the day, with Marilyn packing between errands. Of course, additional errands were added, such as getting money from the bank for our trip and for Isabel to keep the house running in our absence. We also wrote a letter saying that Isabel could pick up a package for us that we had been expecting any day. After a full day (which helped keep our minds occupied), we left for Quito at 7:15 p.m. It was a beautifully clear night, something that seems rare in this part of the world. Of course, it could seem that way because we don’t tend to drive around much at night. We could see the actual lights of Quito from 40 miles away when we topped a mountain pass, not just the atmospheric glow of a large city. On the drive, we reflected that Mark had been able to do pretty much what he wanted in life. He’d retired early. He’d gone hunting and fishing with numerous friends every year. He’d enjoyed riding ATVs in Utah yearly with other friends. He used to run, as well as ride bicycles. He found a very good wife in Marcia. He was successful in the fire department, retiring as Assistant Chief. He returned to work about 18 months after retiring, for CAL EMA and reached his goal of becoming a Deputy Chief. He’d had a good life, and that seemed to make his sudden death just a little easier to bear. We spent the night with our friends in Quito, Luis y Blanca. After talking about Mark and other things, we went to bed about midnight. Having gotten up at 3:00 a.m. and being driven to the airport by Blanca and Luis, we flew out of Quito at 6:35 a.m. This time, we went through Houston and Denver on our way to Sacramento. We arrived at El Camino Gardens, Doris’s residence, about 10:30 p.m. It was good to see Doris, and she was glad to see us. El Camino Gardens is a retirement community. They have one, possibly two apartments, that they set aside for out-of-town guests of the residents to rent. We’ve stayed there quite often since Doris moved there. Thus, we’re pretty well known amongst the residents and staff. As soon as he heard what had happened to Mark, Robert (the head of maintenance) put our names in the room reservations book. That was very much appreciated because we definitely wanted to be near Doris on this trip rather than stay in a hotel. Marilyn helped Doris with some errands, including appointments regarding replacing Mark’s name with Marilyn’s name on some financial documents. I helped decide what to do with various accounts. The staff at El Camino Gardens, as well as Doris’s friends there, were very solicitous to all of us, stopping us in the halls, walking over to our table in the dining room, etc., to express their condolences. It gave us yet another reason to be thankful that Doris (with Mark and Marcia’s help) had found that particular retirement community. We went to see Marcia in the afternoon. She gave us more of the details. Doris and Marcia both told us about how firefighters swarmed the hospital Sunday night and Monday morning. Marcia had made one call to Mark’s boss, the Chief of the Fire and Rescue Branch at CAL EMA, and that was all it took to precipitate the flood of firefighters. 9/11 impressed on the nation just what a Band of Brothers firefighters are. This was proof, if we had needed any. Mark and Marcia recently had to cut down an oak tree in their front yard due to disease and Mark was in the process of cutting and splitting it for firewood when he died. A firefighter saw how much still needed to be done and told Marcia not to worry about it. Sure enough, this morning a group of eight firefighters came over and cut and split the wood, not to mention hauling it to the house in Alta. Don and Pam, with whom Mark and Marcia had become very close friends, were helping Marcia attend to the countless things that needed doing. It had been decided that the Memorial Service, or Celebration of Life, would be held September 16th, three days before we were scheduled to leave for Texas. Marcia, like Doris and Marilyn, was holding up well. The dogs were still pretty upset, though, and craved our attention. They, of course, knew that something was amiss. Chase and Spencer are both yellow labs and are, first and foremost, companions. They have also been faithful hunting dogs for Mark. They enjoyed our company and settled down a wee bit. It’s hard to calm Spencer down, though. He’s the rambunctious adolescent. It was difficult for all of us to see Mark's obituary in the Sacramento Bee newspaper this morning. Fortunately, we were able to take a break from attending to details caused by his passing. One thing we did was go out and buy Marilyn a new Macbook Pro. Hers was seven years old, getting slower, and getting so it couldn’t handle newer software. Coincidentally, Marcia bought a new Macbook Pro today, too. That surprised me because I knew she was comfortable with PCs. She said, however, that she finally got tired of the crashes and losing data. Macs forever! We went to see a lawyer about Doris’s trust. We decided we’d think things through more and go back next Monday. Doris was not up to making decisions today and we wanted to be careful that everything was not our decision. We gave our opinions, but no more. She’d be able to make good decisions after she had time to think. We also went to South Lake Tahoe. Doris still had some things from her deceased second husband, Al, that she wanted to give to Al’s son, who lives there. On the way, we stopped at Lake Jenkinson, a few miles off of Hwy 50, to eat our sandwiches at a state park. They told us it was $10 to get into the state park, so we ate our sandwiches in the rental car, in the parking lot, overlooking the lake. Cost: $0. Thus fortified, we decided to stay on Hwy 88 to Hwy 89 rather than go back to Hwy 50. However, we were stopped cold by blasting for highway improvement, just before Hwy 89. They said it would be a two-hour wait, so we went back to Hwy 50 after all. At least, we had great scenery both ways. Bob and Lelaine were glad to see Doris, but were sorry to hear about Mark, of course. They have another cabin (house, I guess) on the property and invited Marilyn and I to stay sometime. They’re about a block from the shores of Lake Tahoe. It may be nice to take them up on their offer. We’ll see. We got back too late for dinner, so Marilyn went out and got some lasagna and shrimp linguini from a nearby Italian restaurant. El Camino Gardens provides three meals a day when we rent a guestroom. At $55/night, you can’t beat the value. I wrote a letter to Mark and sent a copy to Marcia and told her I intended to put it in the online guestbook. I wanted to give her a chance to tell me if she didn’t like something. Everything I wrote came from the heart. Micheline and Uncle Wayne came over for lunch. We ate outside and had a really nice time talking about Mark and other things. Micheline is always so positive. Marilyn and I walked over to Seritella’s Restaurant and asked, 1) if we could watch the LSU/Mississippi State game on Thursday night and, 2) if they sold Henry Weinhardt beer. The answers were yes and no. They would have the game on, but didn't sell that beer. However, they agreed to get two (I'm a lightweight now) before we got there on Thursday night. My intention was to drink a beer in Mark's honor. He had introduced me to Henry Weinhardt when I was in CA meeting the family before Marilyn and I got married. For a long time, he always made sure I had Henry Weinhardt available when I visited the family. When we drove up to the restaurant tonight, we met the bartender coming back from a beer run. He had tried three liquor stores (when he probably should have gone to Walgreens or a grocery store) and couldn't find Henry Weinhardt beer. So, I failed in my mission to drink a Henry Weinhardt in honor of Mark, at least for tonight. Marilyn had invited three of her mom's friends from El Camino Gardens, and we both had invited Robert the maintenance man, so it turned into a party. It was an Italian restaurant so we all had pizza. And, even though we didn't have Henry Weinhardt, and Robert and I were the only ones drinking beer, we toasted Mark. It was a nice remembrance. Today was the Celebration of Life Service and, if such a thing can be said, I enjoyed it. Marilyn, Doris, and I left El Camino Gardens at 9:10 a.m., after having breakfast with Helen and Thelma. We arrived at 9:30 a.m., an hour before the service. The hall was already starting to fill with scads of Mark’s friends and family. The El Camino Gardens bus took Helen, Anne, Thelma, and anyone else who wanted to attend. That was very nice. Pat and Glenn Miller, longtime friends of Doris’s, were allowed to drive over to El Camino Gardens and take the bus with everyone else. That was even nicer. The service was not religious in nature, aside from a couple of readings. The only thing that really made me cry was the slideshow Marcia and friends had put together. Mark looked so full of life. I enjoyed the speakers and the "Mark stories" they told. One speaker was a 17-year-old boy Mark had befriended at the shooting range and was mentoring. Scotty was exceptionally poised. He had called Marcia shortly after Mark’s death and, with sobbing voice, told her he had lost a father. It was a great tribute to the way that Mark reached out to people (which we hadn’t known about before). During the entire service we learned that Mark and Marcia were so much more giving than we had ever dreamed. That was so uplifting. Also, Marilyn and I had been under the impression that he and Marcia only had a few friends - that they were kind of insular. That notion was quickly dispelled not just by the sheer number of people who attended, but also by the speakers. We understand that every fire department flag in the state of California was at half-mast today. When the ceremony was concluded, Marilyn and I sat with her cousins for a barbecue lunch intended to feed everyone in attendance. In other words, it was quite a spread. Doris sat with the Fancy Ladies, a group of women she’s been friends with since her high school days. Sorry to let the cat out of the bag, Doris, but that’s more than sixty years. Marcia graciously greeted those who had come and then sat with her family for the meal. The cousins at our table talked about planning an annual get-together, preferably when we were in town, maybe in June after the teachers in the family are off from work and before everyone scatters with their own vacation plans. No doubt, the conversation was spurred by Mark’s sudden death. But, I think part of it was the realization that it was our turn to step up to the plate. The “Brown family” has had a wonderful tradition of family gatherings each year. If that tradition is to be perpetuated, it will be up to our generation to shoulder more, and eventually all, of the responsibilities for making it happen. We have been back in Ecuador since September 27th. After we left California, we spent a week with family and friends in Texas before returning to our Ecuadorian family. We especially enjoyed camping with David and Lynn, my brother and sister-in-law. Since our return to Ecuador, we have slowly, painfully, sometimes grudgingly, sometimes joyfully, returned to our routines. The one exception, of course, is that we think about Mark every day. In fact, borrowing a page from the people of Mexico, Marilyn has put together a small shrine to Mark. We don’t pray to him, of course, but it is a way to remember him with love. 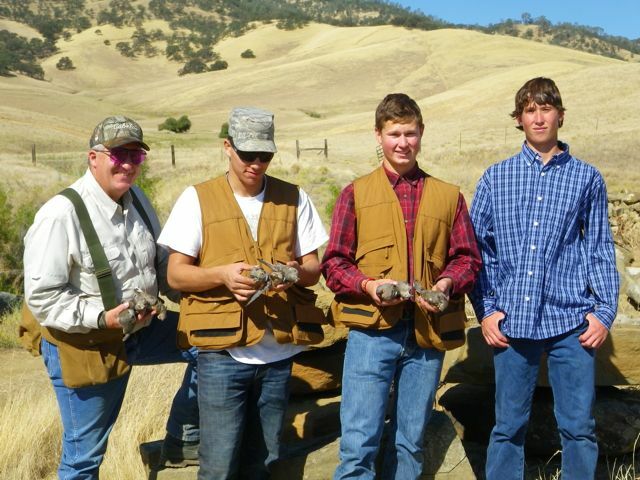 When Mark’s buddies went hunting in South Dakota a couple of weeks ago, Marcia sent along a portion of his ashes so they could be sprinkled on a land that provided him great enjoyment each year. The rancher who owns the land set aside a certain place that Mark loved. Obviously, he’ll be remembered by more people than just his family. Today is Thanksgiving in the US. Marilyn is working today, so we won’t have our Thanksgiving dinner until tomorrow. Marcia and Doris are at the house Doris’s father built in the foothills of the Sierra Nevada, another place that Mark loved. Though we’re not celebrating until tomorrow, this day reminds us of how much we have to be thankful for – our family, our health, our friends, our capacity to continue learning, sharing, caring, and our God. Today is Thanksgiving, a day I feel I can finish writing the things I wanted to share about Mark on our blog. Thank you for your presence in my life, Mark. And, thank you, for the things you’ve shared with me through your physical absence. I stayed in bed this morning while Marilyn went to get some cachos (beetles). Yesterday Marilyn delivered the gifts we wanted to give to the workers at Caluquí. They were Christmas decorations that Marilyn had made, so we wanted to give them early. Lucilla, one of the workers and the mother of Natasha, our goddaughter, told Marilyn to come back at 7:00 a.m. on Friday morning and she would have some fresh cachos to give to her to eat. Isabel knew how to fix them and she was pretty excited. We told Isabel we’d try them, but made no further commitments. Before Marilyn left, we heard Victoria call Isabel, but neither of us thought anything about it. Victoria often cries out for Isabel’s help. When Marilyn returned, we learned that Victoria had fallen in the bathroom and hurt her wrist. It looked like it was dislocated but seemed to hurt like it was broken. Unfortunately, Marilyn had left the car at the mechanic’s, so Isabel had to take Victoria to the public hospital in a taxi. They said that the wrist was dislocated and not broken. Isabel said that the medical personnel distracted Victoria, and then quickly popped the wrist back into place. ¡Ay-yai-yai! Victoria was still in a lot of pain by the evening, so Marilyn and Isabel took her to a private doctor. They found out that Victoria had indeed fractured both the ulna and radius near her wrist. We hate to think what damage the doctors at the hospital possibly did by “relocating” the “dislocation”. They didn’t have an X-ray machine at the public hospital, so I'm sure they were giving it their best guess. The private doctor, on the other hand, had access to an X-ray machine. Victoria now has a soft cast and is much more comfortable. We’re grateful that it wasn’t her right wrist or, God forbid, her hip. We celebrated the November and December family birthdays at our house tonight. Marilyn made three cakes today, all of which were great, if a little misshapen due to the altitude. The family used to buy the birthday cakes. However, after tasting some of Marilyn’s cakes, they asked her to make them this time. We had 23 people here this evening and it was fun, though most people were tired from the workday. It is usual here to work six days a week. Isabel also prepared the cachos today. She fried them and Glenn thought they were pretty tasty. Marilyn ate three, with eyes closed, and left it there. She had trouble getting past the idea of eating insects. Some guests ate them, and some did not. In some ways, the meat of a cacho sort of reminded us of the meat of a crawfish, but smaller and a little crunchy because it was fried. Isabel said that these were smaller than normal - that they get to be the size of (Eeuuu!) 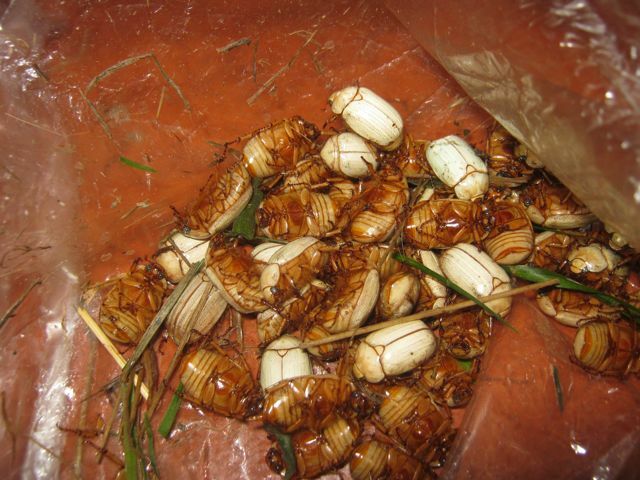 large cockroaches - so maybe the normal size yields about the same amount of meat as a small crawfish. They must be peeled, as crawfish are, so there is no labor saved during that process, but that is done during preparation. Cesar told us that these cachos emerge from the ground once a year, and that they were a real gift from Lucilla and Elias. He also said that they only emerge from 4:50 a.m. to 5:00 a.m. After 5:00 a.m., nada. I took that with a grain of salt until we heard the same exact story from Lucilla and Elias the very next day. 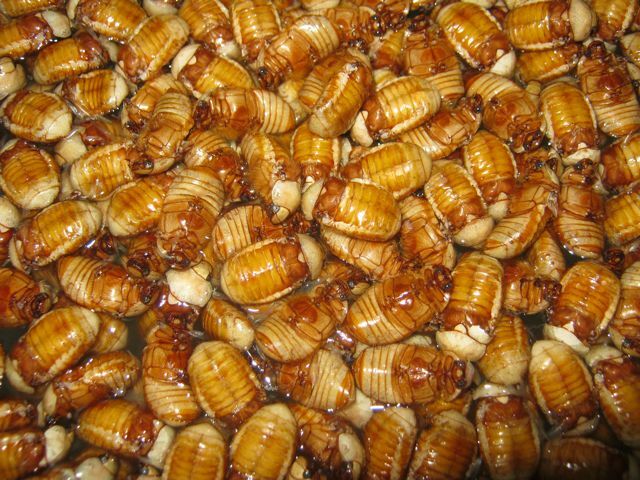 Glenn looked on the Internet and couldn't find cachos, at least not relating to bugs. He found a card game called Cacho, and something concerning bullfights, but no matter how creative he got with his search terms, there was nothing about an animal called cacho. We were sure it was a Quichua word, but he thought he could find some information. Isabel confirmed that it was a Quichua word (we're not even sure of the spelling), and both Isabel and Victoria thought that they only occurred in Imbabura Province. 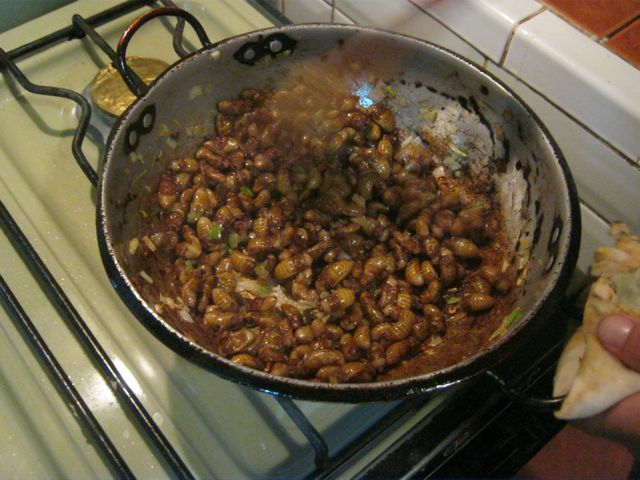 Isabel told us that once, when she was living in Cayambe, she had an allergic reaction from eating too many of them. She went to the doctor and, in response to his question, told him she had been eating cachos. He had never heard of them. Cayambe is only about 40 kilometers from here. Our friend Pat Billings emailed today and said she’d like to visit us in 2012. That’ll be fun. We’re already looking forward to a visit from Roberta and Tom Reardon this month. They’re arriving in Ecuador on the 19th and, after their first night in Quito, will stay at our house until the 24th or 25th. Then, Glenn hurriedly read an email from Julie Sanford and mistakenly thought she was also coming to visit because she said, “Hope to see you in March.” It looked like the prediction of everyone deciding to visit in the same year may be coming true! When Marilyn read it, she told him that Julie was referring to a possible visit by Marilyn to Julie’s Intermediate Spanish Leisure Learning Institute class in Austin in March. Oh, well. Guess people are not exactly beating a path to our door yet. After Marilyn got Glenn’s teeth brushed and before she got her teeth brushed, Alfredo, Victoria's oldest son, dropped by to visit. This is his second visit since we moved into the house in February. He helps pay for Victoria's needs, but doesn't come over from Ibarra very often, so this was a nice gift for Victoria. Then, before Alfredo left, Victoria's younger sister and her husband came over for a visit. Victoria’s sister has Alzheimer's, but Victoria enjoys seeing both of them a lot. Victoria’s sister fell this year and broke her hip, so she now uses a wheelchair. They stayed through lunch. Just after they came, it was time for Glenn’s football, so he excused himself and watched it until lunch. He’s not very reticent when it comes to football. We had already invited Natasha, our godchild, and Lucilla and Elias, her parents, over for lunch. They came two hours late, though, so we had given up waiting and had eaten by then. They brought Rosa, Elias's sister, with them. After a little visiting, we served them lunch also and talked with them while they ate. Then we visited some more in the sala (living room) and looked at pictures of Natasha's bautismo (baptism). That was when we became her godparents. It was very enjoyable. We also printed some pictures for them to take home. It was pretty neat to see Natasha playing with Brayan, and pretty neat that Brayan didn’t mind playing with a 3-year-old. When everyone had left, Marilyn was certainly glad that she didn't have any more preparation work left to do for this week’s classes. The day had been long and a little tiring, what with all of the visitors, both expected and unexpected, but it was also wonderful. And Glenn was extra happy because his football teams won, the ones he had excused himself to watch. Heaven knows, we can’t forget that. We spent some time in the US in September. On one of the last days we were there, we drove down to Canyon Lake, TX, a 1 ½ hour drive from Austin. David and Lynn, my brother and sister-in-law, were camping in their RV and invited us to join them. It wasn’t the state park, as I had assumed, but a private campground. David and Linda, his former wife, had gotten a membership in it when they purchased a lot nearby. When they split up, Linda got the lot and David got the membership, which costs about $250 a year. But, for $250, he can camp there up to 14 days a month at no charge. Not too bad a deal, especially when he has 14 days off at a stretch because he’s a helicopter pilot working in the Gulf of Mexico. We went to the campground and David and Lynn got the key to the cabin that they had rented for us. When we tried to pay them back, they wouldn’t take it. It made me sorry we had gone Dutch with them at the restaurant, but we appreciated it. They also put some corn out for the deer so we could watch them feed for a while. It certainly didn’t take long for the deer to show up. Neither did it take long for them to gobble up the corn. Marilyn wanted to swim in the pool, but I convinced her that now was the time to take a drive because we were likely to see more wildlife in the late afternoon. With David driving, we wound along the Guadalupe River spotting animals, mostly deer. We went to Canyon Lake and found that it was not nearly as low from the terrible Texas drought as we had expected. David also took us by the lot that he and Linda had purchased. It now has a very nice house on it, and a great view. I teased David that he should offer the owners what he paid for the lot. Who knows? Maybe they’d actually go for it in this housing market. Marilyn got to go swimming when we got back, though it was after dark. Lynn didn’t have a bathing suit, but Marilyn convinced her to go swimming in a T-shirt and shorts. There was no one else around. The evening was warm, but apparently the water was really chilly because they both had trouble getting in. David and I enjoyed watching them enter the pool inch by inch. Marilyn says she used to laugh at her father when she was a kid because he did the same thing. I’m sure he’s up there laughing at her now. As for myself, I’ve never, ever, in my 62 years, made any attempt, even an itty-bitty attempt, to tell people I could handle cold, or even “luke-cool” water. Later, we saw the real wildlife. Marilyn and I were talking and snacking before going to bed in our cabin, when Marilyn saw something out of the corner of her eye. She thought it might have been a reflection from the frame of her glasses. Then I saw a mouse scurry from under a table to under the couch. Then she saw it dart from under the couch to near my feet, and back to under the couch again. Brazen little thing. We opened the door and Marilyn stomped near where the mouse was last seen, but I didn’t see it go out of the door from my observation post. Marilyn asked me to confirm that rats bit people, not mice. I figured mice wouldn’t bite unless rabid, but really didn’t know. However, I gave Marilyn the answer she wanted to hear (“Yes, rats bite people on occasion, but mice never bite people.”) so she would sleep better. I withheld the suspicion that this little rodent might be curious enough to run across our sleeping bodies - and we both slept soundly. We went over to deliver Natasha’s birthday present this afternoon. We got to Lucilla and Elias's about 5:00 p.m. They had just painted most of the house that they built recently, and the part completed looked very nice. Elias wasn’t home. Lucilla told us he was in the Chota Valley buying some blackberry plants. He’s rented some more land and intends to raise blackberries on it in addition to the strawberries he already raises on another piece of rented land. We hope they do well. Natasha was taking a bath when we got there, but Lucilla brought her down shortly thereafter. I hadn’t been there in so long that poor Natasha didn’t remember me at first and was a little scared of me. I was careful not to seem too aggressive, however, and she soon started to come around - a little. Natasha wasn’t too impressed with the dresser we got for her birthday. No 3-year-old would be. But we think Lucilla and Elias appreciate it. Also, Natasha will have this for years to come, and will remember who gave it to her. A toy would probably be broken, or lost, or forgotten, in a few months. Her parents had wanted us to get her a piece of furniture for her baptism, but we opted to get a child’s bible instead. Next birthday, maybe we’ll become the stereotypical godparents who bring the magical toys. We had tea and crackers, and talked for a good hour before coming home. One of the things Lucilla told Marilyn made us both glad. 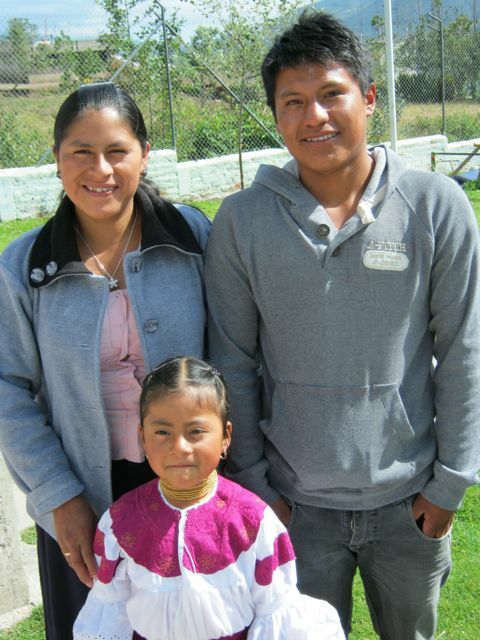 She told us that she and Elias had given the old clothes Isabel had donated to some very poor neighbors. Hearing how Isabel’s gift was used was a true gift to us, as well as to Isabel. We invited Oliva over for café (a light evening meal). She is Victoria’s eldest daughter and, for the time being, lives in Espejo. Her job is to keep an eye on one of Alfredo’s distribution warehouses, so she lives on the property. Alfredo is Victoria’s eldest son. However, Alfredo has given up the operations side of the business and the new owners intend to install surveillance cameras, so Oliva will be out of a job and moving to Ibarra soon. Inez, Oliva’s daughter came with her and, in turn, brought her daughter and new baby boy, José Gustavo. José is just one month and eleven days old. A few minutes later, three more members of Oliva’s family showed up. Yolanda, another daughter of Victoria’s, was already here doing her laundry because her water was not working, and Carrolito, Yolanda’s husband, also came over. Then Agusita, Luz, and Cesar got here (but we had invited them). Then Edgar, a son of Oliva’s, and his daughter made an appearance, though that was after café. We had expected to host Oliva, one or two members of her family, and Cesar’s family. Instead, it became a large gathering. We don’t mind, but it never ceases to amaze us that we can extend an invitation to one or two family members and have many more come along for the ride. I sense that Oliva’s family is a little poorer than some of the rest of Victoria’s children’s families. That’s relative, though, as all but one of her children have trouble making ends meet. Plus, most of Oliva’s family live in Espejo. Espejo is not that far from here, but it’s still a different town. Thus, they have chosen not to participate in our monthly birthday celebrations, which don’t fit their pocketbooks. That is also the reason we decided to invite Oliva for café. We wanted her to know that we have not forgotten about her, and we thought it would be a nice opportunity for her to visit her mom. I was leaving my office to join everyone in the kitchen when Isabel brought the baby to me. Besides admiring how cute he was, the first thing I asked was, “What’s that red spot on his nose?” Isabel explained that the baby was always looking upwards. When that happens with babies they often put a red spot on their noses to attract the baby’s eyes downward. 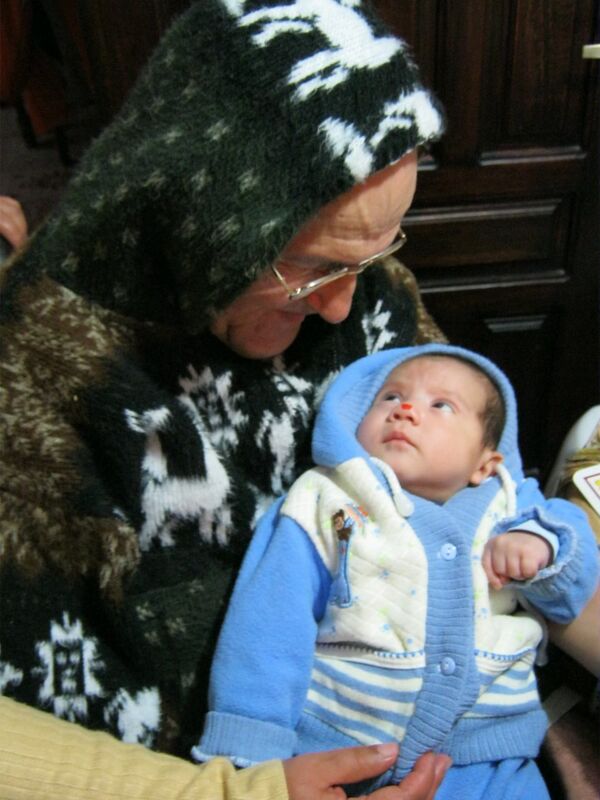 We found out about another custom later, when Marilyn was holding José Gustavo. She began to sit the baby up in her lap, when six or seven adults gasped, “No!” They explained that no one sits a baby up until they are three months old. It’s supposedly hard on their spine, I believe. Marilyn and I don’t have much experience with babies because we chose not to have children of our own. So, if this is also true in the US, we’re not aware of it. As I learn about new customs, rituals, and methods, I think more about how we, and the people we know, do things in the United States. Often I believe that the methods we use are better, which usually means more efficient. In a lot of cases, I admire the way something is done here more than the way we might do it in the States. This is usually the case when I see a custom or method whose practice leads to greater community. We have often commented to each other that, aside from cell phones, the Internet, and a few other modern-day marvels, Ecuador reminds us of the US in the 1950’s. That was a time when our country had more community and a slower pace of life. Neighbors kept an eye on neighborhood kids and reported them to their parents, not the police, if they really got out of line. People often stopped to talk to neighbors and even strangers on the street. Now they’re often so tired after work that it’s all they can do each night to push a button to open the garage door, drive a car into that garage, push another button to close the garage door, walk to the living room couch, and veg-out in front of the TV or a laptop for the rest of the evening. This scenario is exaggerated for a lot of people in the US, but it illustrates a point – there are not as many opportunities in the US to build community as there once were. I’ve read, and even observed in the past year and a half, that customs and ways of doing things in Ecuador are changing. 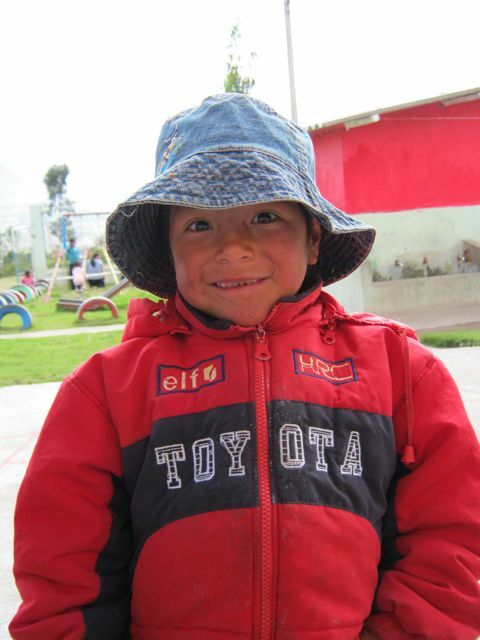 As more and more people in Ecuador are able to afford cars to ride in instead of walking or taking a bus, as more and more people can afford houses on the edge of towns (like us) instead of living in bustling town centers, as more and more people use clothes dryers instead of hanging laundry on clothes lines where they might see and talk to neighbors, people are running the risks of becoming more and more isolated from each other. Yet, who would deny these conveniences to anyone, especially if the person had only recently experienced poverty? Certainly, not me. However, I hope the people of Ecuador will be deliberate in how they change. It can be all too easy to replace a material poverty with a spiritual poverty, and I hope that doesn’t happen. Ideally, Ecuador’s people will augment their spiritual wealth with the material wealth that progress brings. As for showing up for café at a friend or relative’s house without a direct invitation, few norte americanos now ever do such a thing. But Ecuadorians think nothing of it most of the time. And, you know what? We think the custom, or social more, or whatever you want to call it, is a bonus to our lives. The famous Yamor Festival kicked into high gear with a parade tonight. Otavalo has been having this festival for years. Many people come from out of town to enjoy themselves. The locals enjoy it, too, of course. Yamor is a traditional, non-alcoholic drink made from corn. The festival was named after the drink. Glenn was surprised to find that yamor was a non-alcoholic drink. For a guy raised in New Orleans, it just didn’t compute to celebrate a drink sans alcohol. But he reasoned that there were probably other festivals named after non-alcoholic drinks somewhere, like a Milk Festival in Wisconsin, or a Juice Festival in California, or a Coffee Festival in, well, somewhere in the world! Last year, we didn't do one thing related to the festival. It's hard to find a schedule and we didn't know you had to go to the município (city hall) to buy one. Isabel helped us this year. It seems to be an eating, drinking, celebrating through live bands and dancers kind of festival. Every restaurant has a "YAMOR" sign on their door. The gardeners of the city have been busy trimming plants and grass in the parks and along the panamericana (pan-american highway) so they would be pretty. Police cadets spent a couple of days cleaning off the graffiti. The curbs at corners were recently painted yellow (not to indicate no parking, but for better visibility). The city center has been cleaned and spruced up for hordes of visitors. Appropriately enough, all this has created a feeling of festivity in the air. We claimed front row seats for the parade on a curb about a block and a half from the reviewing stand. Yet again, Marilyn confirmed that she was not very good at "late" night activities. The parade began around 7:30 or 8:00 p.m. (though we didn't check our watches). At 10:30 p.m., we headed home because Victoria, Luz, and Marilyn were pretty tired. Luz opens her restaurant at 5:00 a.m., six days a week, and tomorrow would be no different. We did take the camera, but didn't feel like taking pictures (a result of Marilyn being tired and a little grouchy). Elvis told us the next day that the parade didn’t end until 12:30 am! Good thing for Marilyn that we left when we did. It reminded us a little of Mardi Gras, except that there were a whole lot more dancing groups accompanied by marching bands, and just a few floats. Nearly all of Otavalo must have been there because there were hundreds of folks watching on our block alone. Behind the scenes were many folks set up in booths to sell food and beer. There were also plenty of folks who were walking around selling stools to sit on, cotton candy, suckers, cigarettes (you can buy just one), plastic cups full of beer, blow up plastic toys, lighted balls and sticks, flashing devil’s horns, etc. There were some amazing groups in the parade. Neither of us had ever seen a brass band mounted on horses! Well, it was more like a marching band, because there were also non-brass instruments, but the horses did the marching, or walking. When it was time for them to move, the band members didn’t stop playing. They merely touched the flanks of the horses and the horses knew where and how fast to walk. It was very impressive. There were also at least two dancing groups composed of elderly people. They were mostly women in period costumes. One group had parasols, and the only elderly male dancer we saw. The other group was all women, half of whom were dressed as men. We’re used to seeing young dancers, and the parade certainly had its share of those, but seeing elderly dancing groups marching in a parade was a novelty, and quite uplifting at our age. 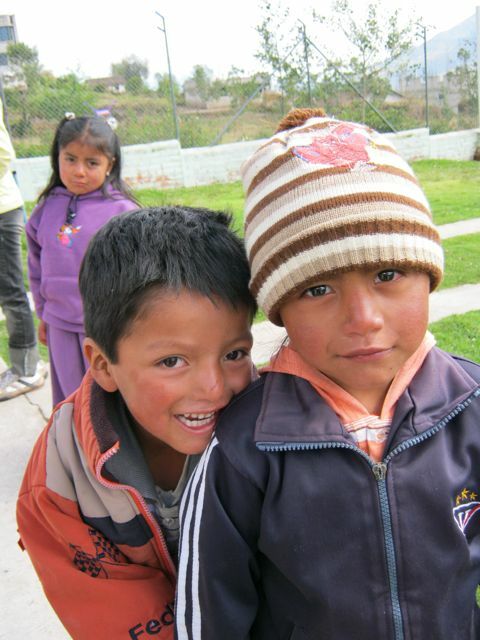 There were many groups who came from far outside of Otavalo. We saw groups from the provinces of Chimborazo and Cotopaxi, hours away by car or bus. We knew Yamor was a big deal (anyone who has stayed at the Hacienda Alli Micuy and seen all of the Yamor posters from past years can attest to that fact), but we still thought the Yamor Festival didn’t draw too many people from outside the surrounding area. 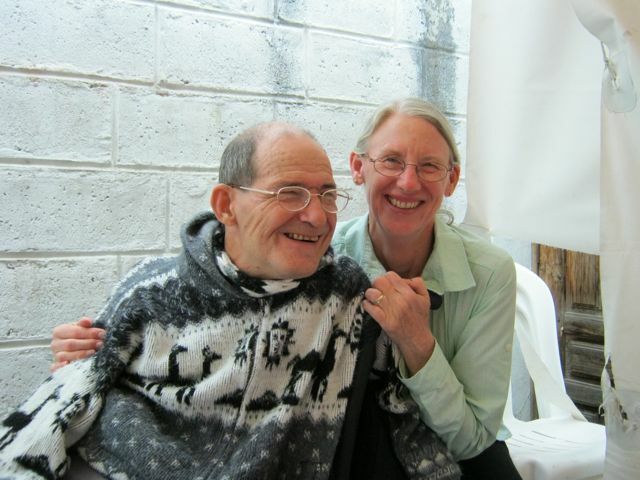 As they passed by, a group member would often shout, “¡Viva Otavalo!” and we would often respond, “¡Viva!” or, “¡Viva…” wherever they were from. 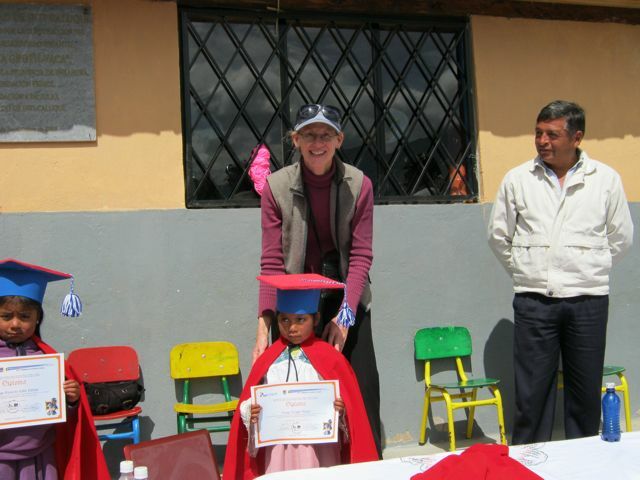 I know it seems late for a “graduation”, but in Otavalo, the pre-escolares run year round. The reasoning is that the schools are caring for the children while their mothers work, and their mothers work year round. So, last Friday was the last pre-school class for the children moving up to the escuelas (elementary schools) this fall. 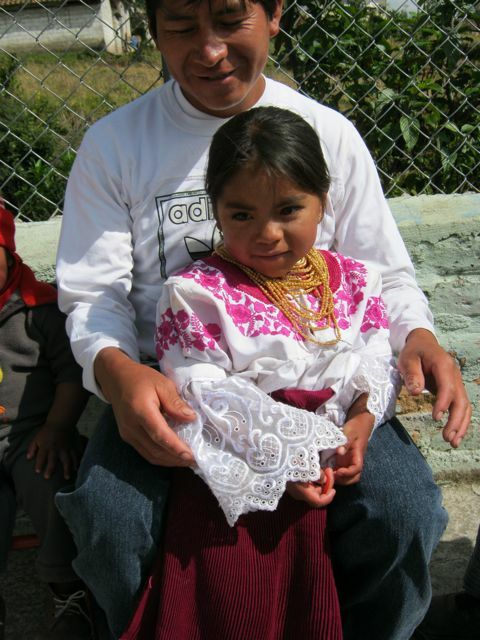 At Caluquí, 10 of the 30 children were promoted. They were the ones who probably were able to say the English words and sentences that I had taught best. • Are you ready for school? • Yes, I’m ready for school. We also worked on “to work; “to play;” and “to eat.” It was fun in a chant and appropriate especially for the children moving on to elementary school. 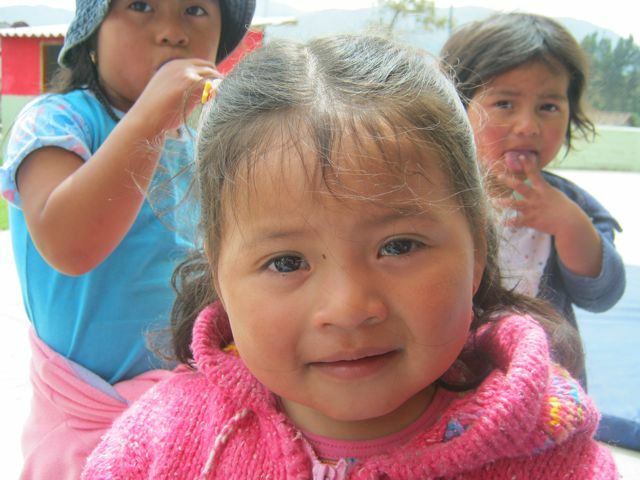 Their regular teachers, Luzmila, Lucila, and Nancy, were all feeling sad. They’ve had the students for up to 4 years and now their charges are off to bigger and different experiences. A special presentation was held to mark the end of their stay in pre-school and those moving on got large promotion certificates. Those parents who could, came to watch and take pictures if they owned a camera. Ariel probably has had a “crush” on me since I began teaching there a year and a half ago. English class is the first activity after breakfast in the morning 2 days a week, so those children who have finished eating come outside to play before class starts. He always runs to the gate to greet me when I come and he likes to hold my hand as I walk across the play yard. Lizeth is a little smaller than the other children her age. One time I picked her up and turned her upside down, something I’ve done with children in the states many times. They usually laugh in surprise as I safely place them back on the floor. This was NOT the case with Lizeth. I guess parents don’t play with their children this way here for she started crying and wouldn’t stop for a while. Needless to say, I haven’t played with any of the other children, except Brayan at the house, since then. Lizeth kept her distance from me for quite awhile after that. Angely is my God Child’s cousin so I should be able to remember her name and face. But she was one of the one’s whose name I forgot on a pretty continual basis. I have always hoped that I’m not damaging any egos by my inability to keep names in my brain. Fortunately, she still seemed to like class and her English teacher. Alegría probably tests at a “slow learner” level. I keep her in my prayers that as she grows older she can keep up. There aren’t usually classes available for the special needs children so those who might benefit from such classes usually fall by the wayside. Dael is pretty cute (not that the other children aren’t!!) and he’s someone I can count on to come up with some unusual words in appropriate phrases. Like all the boys and some of the girls, it’s hard for him to pay attention so it can surprise me that he understands even though he seems to not have been attentive. Yes, I’m a bit sad, too, that the children are moving on. But they are ready and a new group of students will take their places. I’ll have 10 new names to learn at this location, yet that’s far less than the 30 I had when I started teaching English. And now I’m used to the pretty original names the children have so maybe next year when promotion time comes around, I won’t be forgetting any of their names.